We are the most fortunate dog sitters in the world because we get to pet sit for Barley Balland. She is the sweetest dog and we get to play with her for 3 whole days. I promised her Mommy and Daddy that I would post updates of Barley's adventures on our website so they could fly to Arizona knowing their doggy is happy. Well, okay maybe a little tortured, but she will bounce back. 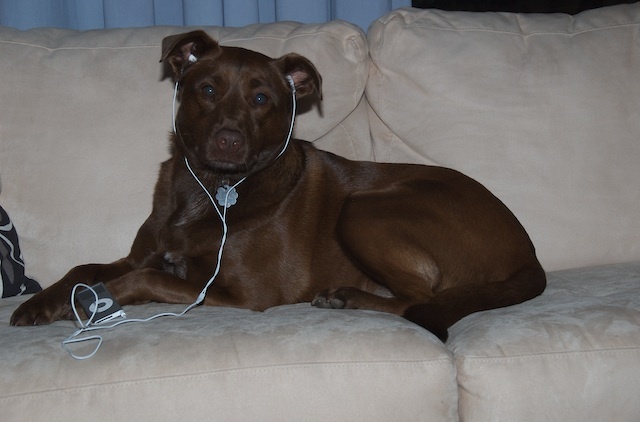 Here is Barley relaxing on the couch with some iTunes. Her favorite song right now is "G Bedtime Stories" by Snoop Dogg.